It has taken 10 years, but master navigator Captain Korent Joel’s vision of having scientists validate the method by which he pilots the waves of the Marshall Islands is now in motion. 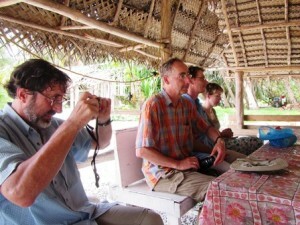 John Huth, a physicist at Harvard University, Massachusetts, and a self-taught expert in navigation, and Dr. Gerbrant van Vledder, an oceanographer at the Netherland’s Delft University of Technology, were both recently in Majuro and met with Captain Korent to attempt to understand the technique he uses to move around RMI’s atolls. 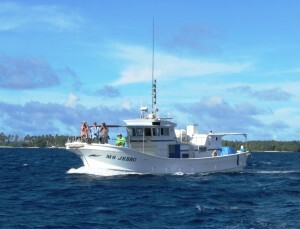 In a related landmark event, the scientists also witnessed the second voyage of a Waan Aelon n Majel (WAM) ocean-going canoe from Majuro to Aur Atoll, 60 miles to the north, in June. The 35-foot canoe is called Jitdam Kapeel, which loosely means ‘seeking knowledge’. It was used in a similar voyage to Aur in 2010. This year’s crew was led by Alson, who has been serving as Captain Korent’s apprentice,’ and included Binton, Sear, Elmi, Ejnar Aerok and Jason Ralpho. The day was sunny and looked like a great day for sailing. “We all got to the pass at about 5pm. Then, as soon as we got out into the ocean, the wind picked up to about 15 knots. The waves were very erratic and stayed that way. “All of us ri-belle on the Jebro were throwing up,” Joe grimaced.” It was a chaotic wind chop from east, a very violent motion. 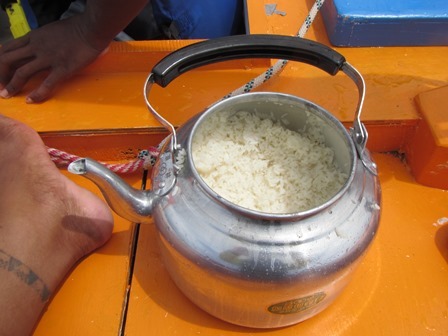 The crew had a little burner under the deck and they did manage to cook some rice. The canoe and the chase boat communicated by VHF, but no details of the canoe’s location were transmitted. “Their course was pretty amazing as they tracked a little bit east of north.” Joe and the scientists were also surprised at how fast the canoe was travelling. “Alson had anticipated getting to the eastern side of Aur for safety. This is because he didn’t want to shunt (to move the sail) because in the waves it would have been too dangerous. In hindsight, had the canoe been able to perform better, they would have made it and gone over the north tip and into Aur’s northwest pass. As it was they sailed across the lagoon to Tobal on Friday, with the local community giving them a formal welcome ceremony with a feast and speeches. “The scientists thought they were in another world,” Joe said. On Saturday the crews enjoyed relaxing, but some repairs were done to the canoe. “They fixed some lashings and replaced the main sheet and main halyard.” The team also installed a light on the mast to make it easier for the Jebro crew to see them at night. 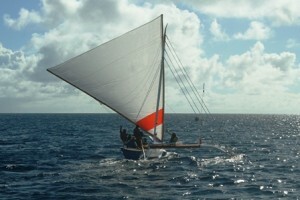 Alson knew he needed to get upwind to make Majuro and he continued to do that. “At daylight we were 20 miles out and he was headed to Rongrong,” which is at the northwestern end of the atoll. “One of his guys worked out which island it was they could see and after that they went straight to the pass. For John a highlight of his visit to RMI was watching the voyaging canoe’s crew “using the stars as a natural compass and comparing the stars marking our passages to the waves and wind. The combination of the three were great to get into the shoes (or stomach) of the traditional navigators. John’s co-adventurer, Gerbrant is a specialist in the research and development of ocean wave prediction models and metocean studies (meteorology and oceanography). “I have little experience with navigation on the open ocean,” he said, “but I have a knack for reading maps and the use of environmental information to find my position on land and to trace the routes taken. Two years ago I heard of the Marshallese method of wave piloting and I was immediately intrigued. My research brought me into contact with Joe Genz and John Huth, and I am very pleased to have been part of the expedition from Majuro to Aur and back. 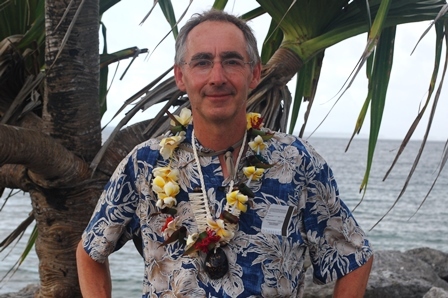 Gerbrant hopes his trip in June to the Marshall Islands is possibly only the beginning of a further collaboration between WAM and the universities of Delft and Harvard to explain all wave phenomena known to the navigators using scientific methods. Joe Genz and Alson Kelen were extremely excited that the scientists came and tried to figure out the wave patterns. “I can also see how the canoes and their voyages have started to inspire people,” said Joe. “On Tabol, there were kids on the beach looking at the canoe and saying ‘What’s that?’ The villager leader, in both his welcome and farewell speeches, spoke of how he wishes to one day have a fleet of canoes lining their beach. “The next step, I think, is that this canoe should be sailed as much as possible and we will continue to study the ‘dilep’. The heavy ‘mast’ of the Jitdam Kapeel makes it tough going to tack the canoe, as this video by WAM Director Alson Kelen shows. The plan to begin coaching a new generation of traditional navigators this summer has taken another leap towards reality thanks to a grant for Waan Aelõñ in Majel (WAM) from an organization linked to National Geographic. The Genographic Legacy Fund is providing $25,000 for the project, which is officially called the Preservation and Training of Marshallese Voyaging and Navigation. Joe Genz, the Assistant Professor of Anthropology at the University of Hawaii at Hilo, who has worked on the navigation program for many years with WAM director Alson Kelen, is thrilled with the news of the grant. “The National Geographic grant will substantially move WAM’s navigation program forward by supporting a long-distance canoe voyage on which a younger generation can begin to learn the traditional Marshallese methods of wave navigation. The grant follows an equally generous donation of $31,000 to WAM from the US Ambassador’s Fund for Cultural Preservation, which was provided in September last year. Kelen said National Geographic has long had a relationship with the Polynesian Voyaging Society. “He realized that what we’re doing at WAM is the same goal as the Society’s, so he approached National Geographic to see if they would want to support us. Both programs are all about teaching youth about traditional skills by reviving those skills and passing them on down. VIDEO: The late Lijon Eknilang, a master navigator from Rongelap Atoll, reads a traditional Marshallese navigation chant. A chant is called a ‘roro’ in Marshallese. 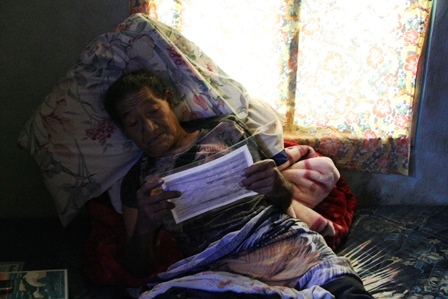 Chants are integral elements in many Marshallese folktales. 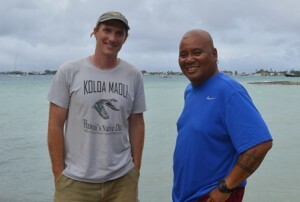 The next key stage of the traditional Marshallese navigation revival project that began in the early part of the last decade is now being planned by Waan Aelon in Majel Director Alson Kelen, expert navigator Captain Korent Joel, and anthropologist Joe Genz. 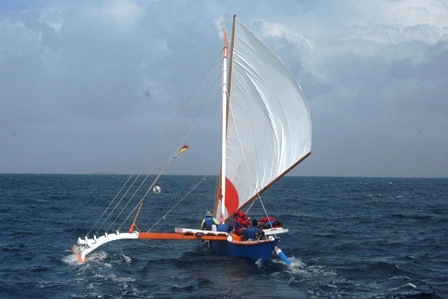 Having researched, re-enacted, and documented much of the uniquely Marshallese skill of navigating using the wind and wave patterns, the trio is now working out how best this important cultural knowledge can be passed on to a new generation of sailors. Karen Earnshaw reports. In the early days of Waan Aelon in Majel, more often known as WAM or the Canoe House, when Dennis Alessio and his recruit Alson Kelen were eagerly working on tapping into the knowledge of the Marshalls’ master canoe builders, American Joe Genz arrived on the scene. “I had been in the Peace Corps in Samoa in the late 1990s, where I became interested in traditional navigation.” This transformed into a fascination that led to meet the University of Hawaii’s Ben Finney, who was a co-founder and first president of the Polynesian Voyaging Society. “Ben took me on as his last student in 2001,” explained Joe as he sat in WAM’s upstairs office. Joe went back to university, finished his master’s degree, and began preparing for his PhD in anthropology, returning to RMI in 2005 to work for a year with the twin goals of researching Marshallese navigation techniques and assisting with the revival aspect of the WAM project. At this time, the only master navigator alive was Thomas Bokin of Ujae. “But in addition to Thomas and Captain Korent, there were six other experts in navigation, primarily from Rongelap, including Isao Eknilang,” Joe said. “And they weren’t all men. One was Lijon Eknilang, Isao’s younger sister.” Of these eight, three have now passed on, including Lijon. “Of course the secrets of the skills of navigation are still very much under traditional chiefly control and there are strong regulations controlling the dissemination of this knowledge,” Joe explained, adding, however, that there is a general perception that there is a need to keep the skills alive and that this can really only happen with an ongoing training program. Alson and Joe worked with the elders for a year. 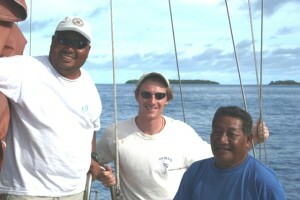 During this time, Joe organized for the deployment of a ‘wave buoy’ in many locations around Majuro and Arno. “We used this scientific instrument to try to understand and document how the waves can be used for navigation.” Joe’s year in RMI culminated in using a yacht loaned by two guys from Kwajalein to test Captain Korent’s skills. In 2012, Joe was hired as an Assistant Professor in the Department of Anthropology at the University of Hawaii at Hilo and this allowed him to apply for funding to continue the navigation project with Alson. This includes a grant from the United States Ambassador’s fund. “I am here now to work out how we can best continue the program,” Joe said. “We still don’t have all the answers on how to read the waves, but we feel the most important thing is the passing on of the skills. In Hawaii, a similar process of connecting to the past led to the building of the famous double-hulled canoe Hōkūleʻa, which has just now embarked on a three-year voyage around the world to raise awareness of environmental stewardship. Genz, Joseph. (2014). Complementarity of Cognitive and Experiential Ways of Knowing the Ocean in Marshallese Navigation. Ethos 42(3):332-351. Genz, Joseph (2011). Navigating the Revival of Voyaging in the Marshall Islands: Predicaments of Preservation and Possibilities of Collaboration. The Contemporary Pacific 23(1):1-34. Genz, Joseph, Jerome Aucan, Mark Merrifield, Ben Finney, Korent Joel and Alson Kelen. (2009). Wave Navigation in the Marshall Islands: Comparing Indigenous and Western Scientific Knowledge of the Ocean. Oceanography 22(2):234-245. Genz, Joseph and Ben Finney. (2006). 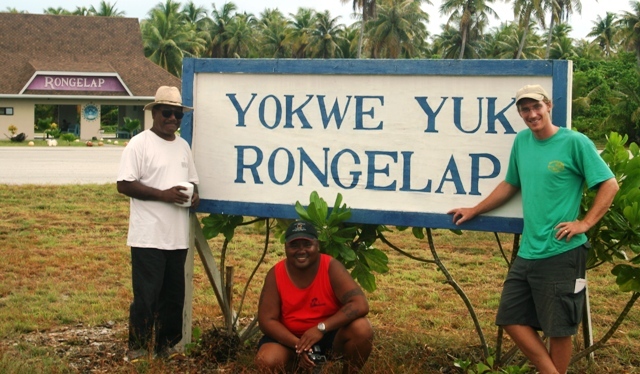 Preservation and Revitalization of Intangible Cultural Heritage: A Perspective from Cultural Anthropological Research on Indigenous Navigation in the Republic of the Marshall Islands. Micronesian Journal of the Humanities and Social Sciences 5(1/2):306-313.